CHICAGO, IL--(Marketwired - August 16, 2016) - Ten million new consumers have entered the credit card marketplace in the last year, pushing the overall total of Americans with a balance on at least one credit card to 133 million at the midpoint of 2016. TransUnion's (NYSE: TRU) Q2 2016 Industry Insights Report, powered by Prama℠ analytics, also found that total balances have increased to $662 billion as of Q2 2016, up 6% from Q2 2015. The report indicated that credit card balance growth has been driven primarily by originations -- both from existing customers and new entrants opening their first credit card. Younger millennials (consumers ages 20-29) comprised 52% of those opening their first credit card during Q2 2016. "Credit card usage continues to increase at levels in line with consumer confidence and likely due to a relatively strong employment market," said Paul Siegfried, senior vice president and TransUnion's credit card line of business leader. 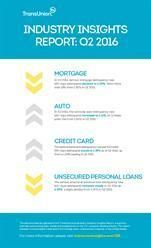 "Consumers tend to apply for more credit cards and use them more frequently when they are gainfully employed." The U.S. unemployment rate has dropped from 5.3 % in June 2015 to 4.9% in June 2016. The unemployment rate is now nearly half of what it was in June 2009 (9.5%) -- the month concluding the "official" end to the Great Recession. "Prime and above consumers represent nearly 79% of all credit card users, so their credit behavior is especially significant for the industry," said Siegfried. "We have seen clear signs of deleveraging in this segment. At the same time, increasingly more non-prime consumers are getting access to card credit, usually at lower credit limits. Together, these trends are causing slower growth of balances relative to accounts," said Siegfried. The serious delinquency rate per borrower (90+ days delinquent) stands at 1.29% as of Q2 2016, up from a 1.20% reading in Q2 2015. "While delinquency has increased, we believe it is in line with the increased share of non-prime originations over the past year. As well, delinquency rates remain low relative to historical norms," said Siegfried. "Our latest Industry Insights Report still points to a healthy consumer credit market," said Nidhi Verma, senior director of research and consulting in TransUnion's financial services business unit. "While more subprime consumers are receiving loans and their balances are rising, we do not see alarming delinquency levels. Some lenders may be taking on more risk, but it's important to highlight that they are doing so with their risk thresholds in mind. This is clearly seen in the credit card space where balances in the subprime risk tier have risen nearly 14% in the last year, yet credit lines for these consumers have not changed." Both total unsecured personal loan balances and average balances reached all-time highs during Q2 2016, though the serious delinquency rate reached its lowest post-recession level. Total personal loan balances grew 26.2% to $96 billion in Q2 2016, up $20 billion from Q2 2015. Average debt per personal loan borrower rose 9.1% from $7,102 in Q2 2015 to $7,745 in Q2 2016. "Despite recent concerns about the FinTech market, our data show consumers' appetite and need for unsecured personal loans continues to grow," said Jason Laky, senior vice president and automotive and consumer lending business leader for TransUnion. "In the second quarter of 2016, more consumers had access to personal loans than ever before. In fact, there are now nearly 3 million more consumers with a personal loan compared to two years ago. Most importantly, consumers continue to perform well on these loans as delinquency rates remain steady." In Q2 2016, 14.79 million consumers had a personal loan balance, an increase of 1.73 million consumers from 13.06 million in Q2 2015. Only 10.33 million consumers had a personal loan in Q2 2013, reflecting the increased growth and interest in this loan product in recent years. In addition, the unsecured personal loan delinquency rate remained steady in Q2 2016 at 3.30%, a slight decline from 3.32% in Q2 2015. Personal loan originations (viewed one quarter in arrears to ensure all accounts are reported and included in the data) grew 13.6% from 2.63 million in Q1 2015 to 2.99 million in Q1 2016. Consumers in the prime or better risk tiers made up 36.4% of originations in Q1 2016. "Lenders are targeting more prime or better consumers, and the origination distribution is reflecting this shift," added Laky. More than five million additional consumers had an auto loan in Q2 2016 compared to Q1 2016, according to TransUnion's latest Industry Insights Report. The number of consumers with an auto loan increased 7% from 72.87 million in Q2 2015 to 77.95 million in Q2 2016. "In recent years, the auto industry has experienced strong growth in truck and SUV sales, which we believe is one of the drivers for higher average auto balances," said Laky. "Strong economic fundamentals -- particularly low gas prices and rising employment -- are contributing to the continued growth in the auto sector." In Q2 2016, the auto delinquency rate increased to 1.11%, an 11-basis point rise from 1.00% in Q2 2015. "While delinquency rates rose in the second quarter, auto delinquency has been at all-time lows. We do not see a cause for concern from this slight increase," added Laky. In Q2 2016, the serious mortgage delinquency rate (60 or more days past due) declined to 2.30%, down more than 18% from 2.82% in Q2 2015. Mortgage originations, viewed one quarter in arrears (to ensure all accounts are reported and included in the data), modestly dropped from 1.48 million in Q1 2015 to 1.46 million in Q1 2016. The decline snapped a five-quarter streak of continuous year-over-year growth. "The mortgage sector continues to perform well, and we expect originations to be more robust when the full Q2 numbers become available. This is mostly due to the unusually low interest rates available as a result of Brexit and other macroeconomic factors," said Joe Mellman, vice president and TransUnion's mortgage line of business leader. "While the mortgage sector performs well, we continue to pay special attention to states impacted by the energy crisis. States with economies heavily reliant on oil and energy are bucking the trend and experiencing higher delinquency rates." TransUnion data show that only three states -- North Dakota (+10.8%), Wyoming (+9.6%) and West Virginia (+0.5%) -- experienced yearly delinquency increases. Average mortgage debt per borrower continued to grow, rising 2.3% in the last year to $192,749. This marked the 5th consecutive quarter of mortgage debt growth and is largely due to the overall increase in home prices. The Case-Schiller Home Price Index rose from 178.92 to 188.29 within the last year (May 2015 to May 2016). 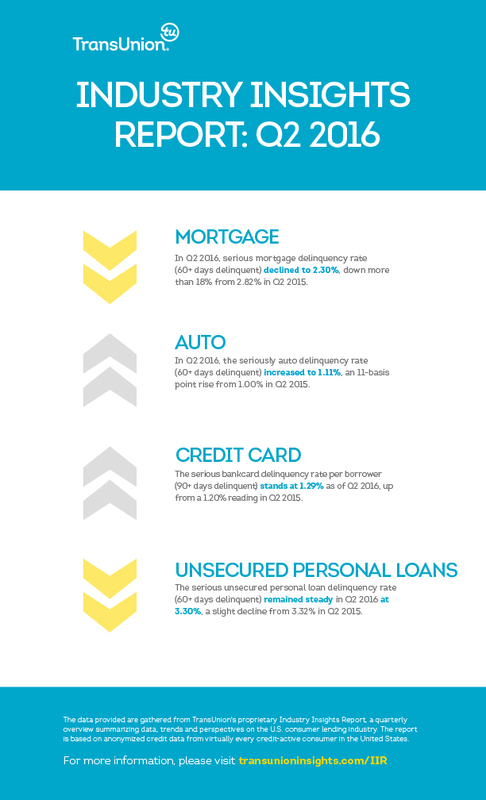 Please visit http://www.transunioninsights.com/IIR for more charts and details about TransUnion's Q2 2016 Industry Insights Report or register for TransUnion's Q2 2016 Industry Insights Webinar.